Learn to raise a self-disciplined child who is confident, independent . . . and happy. 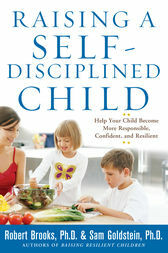 Raising a Self-Disciplined Child is the groundbreaking book parents have been waiting for--a remarkably positive approach to a style of discipline that builds children up-from the acclaimed authors of Raising Resilient Children. Filled with realistic, practical strategies and sample scenarios, it shows you ways to teach children of any age, from preschool to adolescence, the value of self-control, self-reliance, and self-assurance--the all-important skills that will last a lifetime. Robert Brooks, Ph.D., is a psychologist on the faculty at Harvard Medical School. He is an award-winning speaker, author, and educator. Sam Goldstein, Ph.D., is a psychologist on the faculties of the University of Utah Medical School and George Mason University. Drs. Brooks and Goldstein have coauthored ten books, including Raising Resilient Children, The Power of Resilience, and Nurturing Resilience in Our Children.